The target is hit with a rainbow-colored beam. This may also lower the target’s Attack stat. Borrowing the power of the moon, the user attacks the target. This may also lower the target’s Sp. Atk stat. The user creates a bizarre area in which Pokémon’s held items lose their effects for five turns. 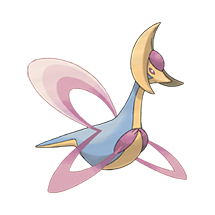 What do think about Cresselia?